Flap copy: A picture book in lyrical rhyme, Baby's Song follows the seasons in a year of a baby's life. Mother and child share the joys that each season has to offer and grow in their awareness of the blessings God has given them throughout the year. The tender test is coupled with warm and personable illustrations, and is sure to be enjoyed over and over again for lap-time reading. 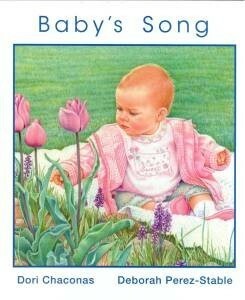 Amazon Customer Review: Baby's Song is a lovely story in rhyme that portrays the seasons of the first year in a baby's life. It also gives thanks to God for all of the blessings that have been given in each season. The lyrics are charming and whimsical: "Splash-a-kicky! Splash-a-kicky! Splish! Splish! Splish! God has made the ocean waves for my little fish." The illustrations are exceptionally beautiful. Done with colored pencils, they are so detailed and life-like that one cannot help but marvel at them. It is fun to see the age progression of the baby as she gets older in each season. On the cover of the book is the young baby. If you flip the book over, the same girl is pictured in the garden as a toddler.